A tech pack is an informative sheet that designers create to communicate with a manufacturer all the necessary components needed to construct a product. Typically designers will include measurements, materials, colors, trim, hardware, grading, labels, tags, etc. Any crucial aspect of your design needs to be described in your tech pack. The more detailed a tech pack is, the less room there is for error. 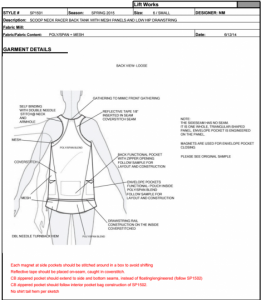 Tech Packs tend to be standardized on a specific format, and they use a combination of expensive CAD design software to create the line drawings of the garments, and Excel to create the worksheet information. If you don’t have the tech packs, and many people don’t, so don’t worry, we also ask that you send us final spec samples in a size run Small, Medium and Large. 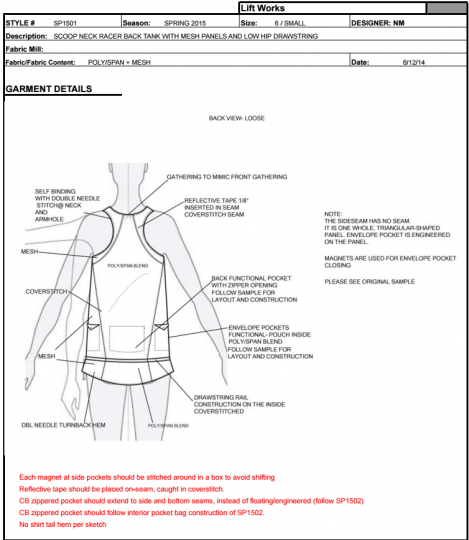 This allows us to review the garment and then we can deconstruct and create our own tech pack. Also send fabric swatches and PMS colors so that we match.